Cricket fans have the Proteas. Rugby fans have the Springboks. And South African food-lovers have a team of men and women in chef’s whites who will be flying the South African flag when they compete against over 40 nations in the IKA Culinary Olympics in Erfurt, Germany, in October this year. “The IKA Culinary Olympics is the oldest and most prestigious global culinary competition; an event that, like the sporting Olympics, takes place only once every four years. The South African National Culinary Team is honoured to participate once again. We have been hard at work for four years, fine-tuning and practicing our Olympic menu to prepare ourselves for one of the toughest challenges on the culinary calendar,” explains the manager of South African National Culinary Team, Heinz Brunner of Crown Outsourcing Consultants. SA Advisors to the team include Chef Garth Shnier, Executive Chef of Sandton Sun, Sandton Convention Centre and InterContinental Johannesburg Sandton and member of the World Association of Chefs Societies Culinary Guidelines Committee (advisor on competition rules, guidelines and cold kitchen). Chef David Higgs, Chef Patron of Marble Restaurant (hot kitchen advisor); and Martin Kobald, owner of ChefMLK School of Cooking (international trends and judging). In the spirit of the wording on the team emblem “Masakhane” – which means let’s build each other – the South African National Culinary Team is inviting the nation to follow their journey to the IKA Culinary Olympics on Facebook, Twitter and Instagram under their newly-launched hashtag #SAOlympicChef. “A strong show of support and interest on social media by our fellow South Africans and foodies will give our team a tremendous boost towards bringing home the gold. Messages of encouragement should include the hashtag #SAOlympicChef,” adds Brunner. 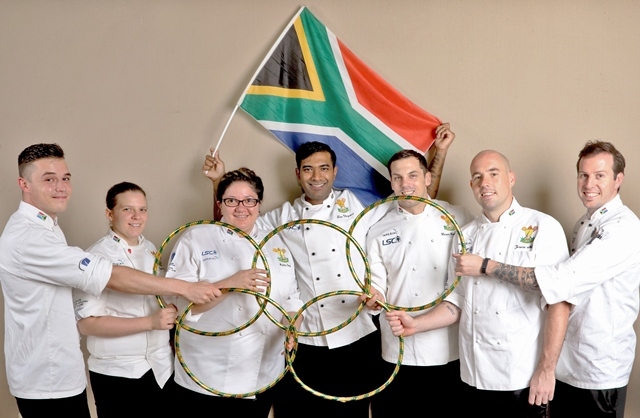 The South African National Culinary Team brought back a gold medal in the Hot Kitchen section in 2008 – the first gold to be won by South Africa in 16 years. In the same year, the South African National Culinary Team was awarded the official South African team status by the Department of Arts and Culture’s Bureau of Heraldry. The 2016 Culinary Olympics will take place from 22 to 25 October in Erfurt, Germany, with about 40 countries competing. The teams will have five-and-a-half hours to prepare their three-course menus to serve 110 people. Starter: Cape Crayfish ‘Malay’ – poached crayfish, pressed carrot terrine, carrot mayonnaise and Malay curry sauce. Main Course: Springbok ‘Masakhane’ – pan-roasted loin of springbok, rolled veal sweetbreads, red cabbage and cider purée, savoy cabbage and Boulangére potato. Dessert: Textured Splash of Raspberry, Rose, Coconut & White Chocolate – coconut sand, coconut sorbet, coconut sponge, rose jelly, rose meringue, raspberry mousse, and raspberry jelly. In mid-March, the South African National Culinary Team prepared their menu for a group of celebrities, media, bloggers and foodies, who continue to share news about the team and their various activities on their different social media platforms. 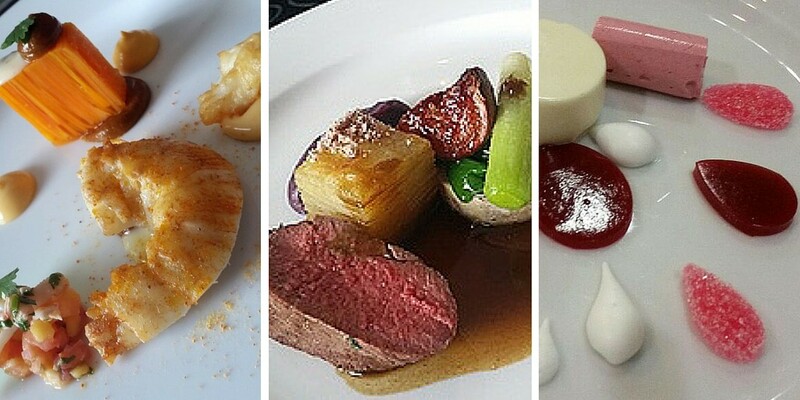 The team’s itinerary leading up to the Olympics in October includes displaying the cold table at Food & Hospitality Africa expo at Gallagher Convention Centre on 3 May; on 20 June the team will be preparing a by-invitation-only dinner for 110; on 18 July, the Team will be preparing another by-invitation-only dinner for 110 at the Mount Nelson Hotel; and finally the team practice concentrating on the Cold Table will take place on 19 and 20 September respectively. The South African National Culinary Team will be participating in the IKA Culinary Olympics under the auspices of the South African Chefs Association. Their participation has been made possible through the generous sponsorship of headline sponsor LSC/Imperial, along with accommodation partner the City Lodge Hotel Group and partners ChefWorks, Turn ‘n Slice and N1 Restaurant Suppliers. The official press statement can be downloaded here.